I’m always looking for alternative, easy lunch and dinner options which I can keep in the freezer. This week’s experiment is Roasted Vegetable Tarts. 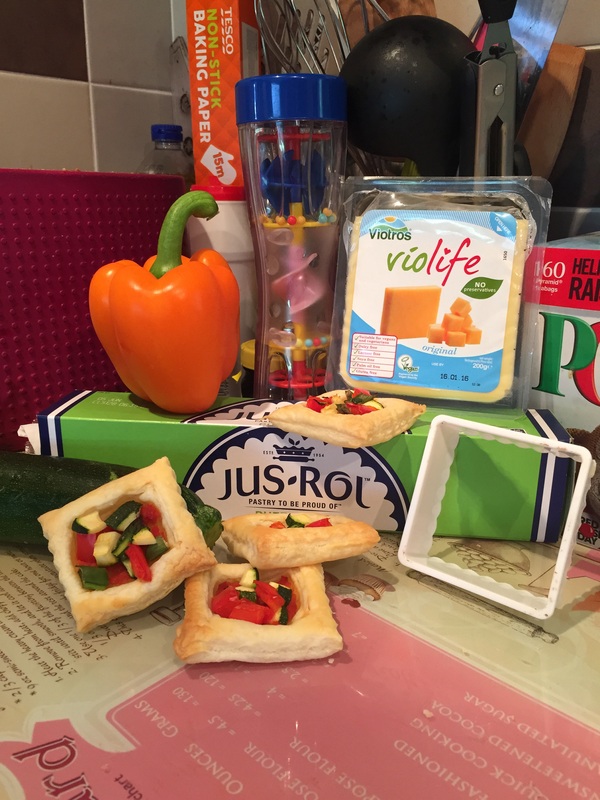 Jusrol puff pastry is dairy and egg free and easy to use. I roasted the vegetables first for 15 minutes so that they softened and released some liquid- no one likes pastry with a soggy bottom!! I also used some homemade tomato sauce, but ready made or tomato purée would work well. See my previous post for my homemade tomato sauce recipe. 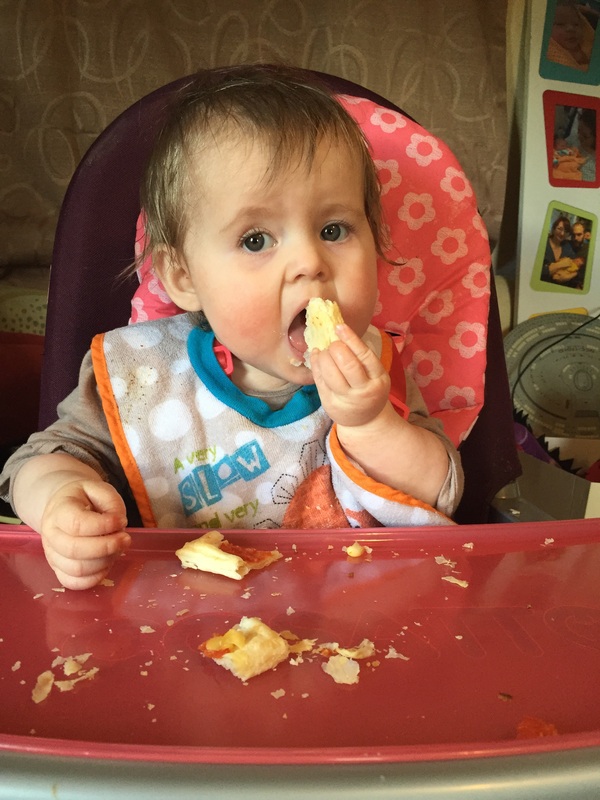 Little one wasn’t sure of the texture of the flaky pastry at first, however the second time of tasting proved a hit and was gobbled up. 1. Pre heat the oven Gas Mark 7, 220 C. Take your pastry out of the fridge to bring it up to room temperature. This makes it less likely to crack and easier to handle. 2. Roast the vegetables in the oven until they soften, for about 15 minutes. 3. Whilst the vegetables are roasting, cut out your pastry cases into squares (or whatever shape you like). Cookie cutters are perfect for this. 4. With a sharp knife lightly score another square 1cm from the edge of the pastry case. This helps create a wall for your filling as the pastry bakes. Using a fork gently prick the centre of the case a couple of times. 5. Place a tsp of tomato sauce in the centre of the case and spread to the edge of the scored square. 6. Top with your choice of filling. I used courgette, asparagus, red pepper and Violife cheese. I piled it high as the filling shrinks in the baking. 7. Cook for 15 mins at the top of the oven or 25 minutes in the middle until the pastry colours. With the tarts being egg free I didn’t glaze the pastry so they were on the pale side. 8. Allow to cool before serving as the filling can be hot. Cool fully before freezing. I wrap them individually and then store them in an airtight container. First try of roasted vegetable tarts! 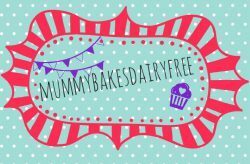 Freezable – I pop them in the oven to warm through once they’ve defrosted. These look delicious. And baby seems to be enjoying them! I will try this recipe on my little one soon. Thanks for sharing it. Thank you. They were a hit, I was half hoping she wouldn’t like them so that I could finish them off!